Cities may be lands of opportunity, but their soot-coated buildings and cement sidewalks can&apos;t compare with the natural drama of mountains, forests or beaches. As urban contractors are often more concerned with function than form, concrete jungles have become increasingly overpopulated and undervalued, oftentimes at the expense of their cultural flavor. Street artists with initiative in locations from Brooklyn to Saint-Étienne are challenging these urban stereotypes and imbuing their city-scapes with humor, joy and even a hint of natural transcendence. Sometimes, all it takes is a little paint and a lot of creativity to turn cracked, filthy plaster into a masterpiece. Here are nine ways artists are making us pause and forget about our mad dash to work so we can appreciate the buried beauty of our metropolitan homes. 1. They make imperfections sparkle. Ask a monkey: Little shiny things can make all the difference. Los Angeles local Paige Smith hides her paper and resin geodes among cracks in walls, where they shimmer like minerals. Her 3-D constructions turn broken pieces of decaying bricks into bright new works of art. As one of the largest cities in the U.S., and one of the most economically stressed, LA benefits from the energy that Smith&apos;s faux gems bring into focus. 2. They use cracked surfaces as canvases. From &apos;20s flappers to Chuck Norris-themed benches, French artist Oakoak imbues poorly maintained city façades with imaginative vivacity. The whimsical street artist, who lives in Saint-Étienne, turns manholes into seals&apos; playthings and scratched gates into sinuous sirens, suffusing his Loire town with an impish warmth. He is especially capable of finding potential in worn-out areas, and many of his designs grace cracked or dirty surfaces. 3. They break down gallery walls. While Manhattan has become New York&apos;s greatest tourist trap, Brooklyn has re-envisioned itself as a cultural capital with stunning artwork on every corner — literally. Brooklyn Street Art is dedicated to compiling some of the most moving images in the borough&apos;s 78 neighborhoods. 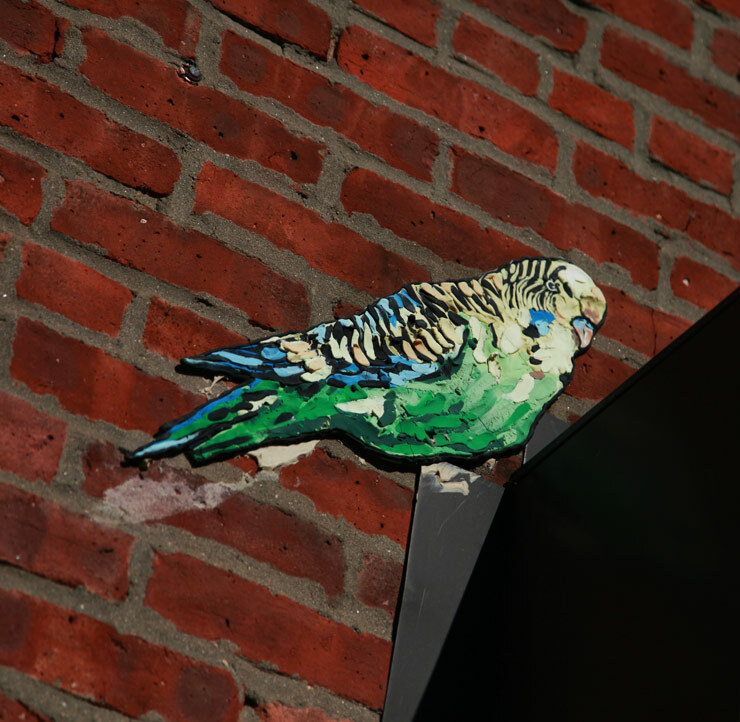 From Mr. Toll&apos;s blue and yellow parakeet on red brick to Ainac&apos;s homage to Passenger, the blog proves that eye-catching art exists outside of the opulent galleries in Chelsea and SoHo. 4. They brighten up the morning commute. DOME&apos;S gorgeous black, white and gray images of faces and bodies fill highways with fascination, if not color. Based in Karlsruhe, Germany, DOME&apos;s Christian Kraemer is a classically trained artist who studied at the Academy of Art in Mainz, Germany. Though he shows his canvases in prestigious galleries, some of his most impressive work exceeds the boundaries of a 20-by-20 frame. After realizing the possibilities that spray paint has to offer in 1995, Kraemer has shared his designs with communities by placing them on the backgrounds that citizens pass on their way to work. Now, his ideas sit on walls around the world, including in Miami, Istanbul and Torino, Italy. 5. They brighten abandoned alleys. TSF Crew is a collective that incorporates the visions of up to 10 skilled artists on a single mural. Conceived over a decade ago, the project defies geographical borders. Works by the group are located on multiple continents, enriching even the most barren of alleyways. 6. They use potholes as props. According to Davide Luciano and Claudia Ficca, potholes can make really good spaghetti dishes. While soaring over a bump in 2009, the couple was inspired to transform their anger into a photographic endeavor. Luckily, both are professional visual artists. Their frustration with poor street maintenance launched a photo series that transforms concrete scars into props. Since the couple has roots in Montreal and New York, they&apos;ve shot in both locations during high-traffic hours, confirming the omnipresence of bad roads and inquisitive drivers in populated thoroughfares. 7. They use Space Invaders to invade dingy spaces. On occasion, subtle messages can speak louder than huge displays. 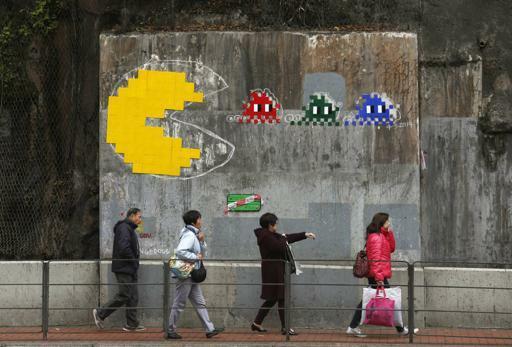 Invader is an anonymous French artist who travels the world fixing mosaics on streets and sidewalks to mimic the pixelated landscapes and characters in video games. He wears a mask whenever he works to keep his identity concealed. His "space invasions" are located everywhere from Amsterdam to Tokyo to Bangkok and are symbols of the generation born into a technological age. The tiles allow for color and whimsy on boring and industrialized avenues, most of which are desperate for an invasion that&apos;s more of an intervention. 8. They bring nature to the city. With fantastical beasts that mirror the magical realism of Carlos Fuentes, Sego y Ovbal implements his familiarity with the Mexican countryside to enliven walls around the world. Especially in Mexico, where the country&apos;s cultural identity is almost as confused as its political situation, his murals demonstrate an understanding of what it means to be Mexican no matter if you&apos;re from Oaxaca or Mexico City. 9. They question reality and then change it. With Spain&apos;s economic recession, it&apos;s easy for residents to lose perspective on how gorgeous their surroundings are, from Gaudí&apos;s Barcelona to Lorca&apos;s Andalusia. Fortunately, artist Laguna has returned to his hometown, Almagro, to remind his neighbors that Spain has a long tradition of a constant cultural renaissance. With his newest mural, "A Midspring Night&apos;s Dream," Laguna channels Dalí&apos;s surrealistic style into a colorful and passionate vision that does justice to the birthplace of Don Quixote and flamenco.